Summer is here, and there is no better time to be thinking about patios, outdoor railings, and garden landscapes. Your outdoor space is an important part of your home. Spending time outdoors can be a great way to relax, have get-togethers, and expand your living space in the warm summer months. There are many ways you can transform your outdoor space to take full advantage of the summer. Like with any renovation, it’s important to consider best practice, trends, and your personality when working on an outdoor retreat, relaxation spot, or gathering point. If you want to create the perfect outdoor space that adds value and comfort to your home, there are several steps you can take. Before getting to work creating your space, consider what you really want to use the outdoors for. Are you going to be spending time with family and friends, or mostly by yourself? Do you want privacy, or do you want a space to entertain guests? There are many different types of outdoor spaces, each with their own advantages. For big families, backyards are often used for BBQs, get-togethers, and children’s play, while couples may prefer a private patio or deck where they can read, relax, and spend quiet time. Figure out what you want from your space. Shaping your outdoor space is easier than ever with the number of trendy railings now available. Using glass railings, you can preserve gorgeous views and unobstructed vistas on your deck, enhancing the beauty of your outdoor space. You can also use railings to shape your patio, creating paths of movement and sectioning off gardens or other off-limits areas. Choosing a low-maintenance railing option will ensure that your patio remains in good condition for years to come. Aluminum railings are resistant to damage and come in classy, refined options, such as wrought aluminum with a lamb’s tongue design. The outdoors just isn’t the outdoors without nature, greenery, and natural colour. Gardens, trees, and shrubbery can help enhance an outdoor space, invigorating it with colour and beauty. Consider simple landscaping options. Landscaping doesn’t have to be extreme; there are many simple choices that can help make your outdoor space more liveable. Vines can be a beautiful addition to your patio or deck railings, while a simple garden beside your patio can make a nice focal point for your yard. Outdoor decor doesn’t necessarily need to involve greenery. Urns, statues, and other decorative additions can also be used to add some colour to your space, as well as coloured powder-coated railings. 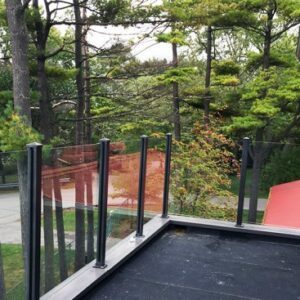 CPL Aluminum Railings & Glass provides low-maintenance additions for outdoor spaces, including decks, patios, rooftop terraces, balconies, and yards. 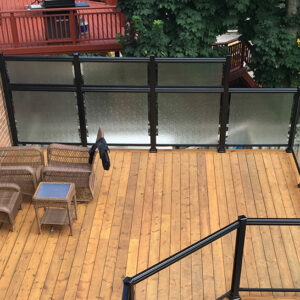 Our aluminum and glass designs can enhance beauty while ensuring safety and privacy for residential, commercial, and public properties. We provide options for decks, patios, and other outdoor renovations. For decks, the key is often to ensure safety while also enhancing beauty and design. 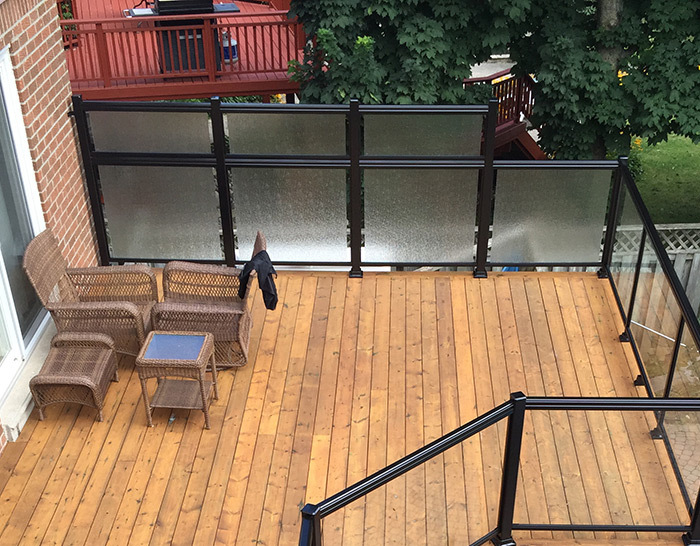 Our glass railing systems preserve unobstructed views, adding beauty to your deck while also providing maximum safety. 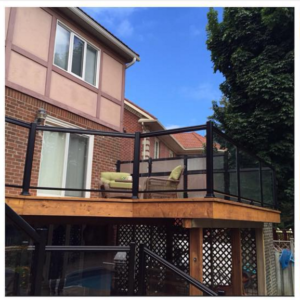 Our aluminum and glass railings can also provide enhanced durability and an extended lifespan, requiring no maintenance or regular upkeep. With patios, railings are one of the best ways to shape your space. The design of your patio can help guide guests, create more dynamic spaces, and improve the look of your outdoor space. We provide wrought aluminum railings with lamb’s tongue designs, offering the beauty of iron wrought railings with the durability and low maintenance of aluminum. With outdoor spaces, privacy can be a concern. Privacy panels can help create outdoor retreats that are comfortable and relaxing, while also adding beauty and design to your space. Some homeowners prefer more seclusion and privacy but still want to enjoy the outdoors. Glass or natural tongue and groove cedar panels can help create your own private, outdoor sanctuary.